Oh, Canada? Thanks for the Butter Tarts! When I visit Pittsburgh, there are certain things that are required eating. It’s unfortunate (or maybe fortunate?) that I’m not there long enough to entirely destroy the faaaairly clean diet I have so carefully constructed for race season. I’m not ashamed to admit that I’ve had excessively vivid dreams about pancakes at Pamela’s. We seem to lack decent breakfast places around where we live here, and really it’s probably the easiest meal to cook anyway, but sometimes…damn, I want those pancakes. However this isn’t about my homeland. The Shakespeare Association of America’s yearly conference was held in Toronto, ON this year, so one of our resident Canadians was waxing poetic about some of her favorite foods from home. One of these was Nanaimo Bars, which if you haven’t made, you really, really should. It’s a three layer bar cookie that has pretty much everything good in it: graham crackers, coconut, almonds, chocolate, butter, vanilla custard…nom nom nom…you get the idea. The official recipe from the city of Nanaimo can be found here: http://www.nanaimo.ca/EN/main/visitors/NanaimoBars.html I followed it to the letter, using Bird’s custard powder as was specifically recommended to me for maximum authenticity. But for me, the treat that sounded most delicious was the Butter Tart. From the very name, you can probably guess why it appealed to me. I’ve given monologues on my love for making pastry dough, and just about any recipe that requires a good pâte brisée is right up my alley. People fear pie dough, it’s one of those elusive kitchen tasks that scares off a lot of cooks. It is heat and humidity sensitive, so you really need to trust your intuition. Fortunately, the advent of the food processor has made it much easier to manipulate. For things like biscuits I still prefer to go by hand, but when it comes to tart or pie shells I really prefer the food processor to get that perfectly fine sandy texture. And honestly? If you put all of the ingredients together and just doesn’t seem right, pat it out until it’s thin, sprinkle some cinnamon and sugar on top, and make cut-out cookies. Bake at 375 F until they feel dry, about 7-8 minutes. Have no fear my friends, because even screwed up pie dough is delicious and useful. Anyway, I digress. After my friend and colleague finished describing the butter tart, all I could think was that it sounded like someone took pecan pie filling, nixed the nuts, and put in raisins instead. Intriguing! Since the tarts are small, I decided to use a butter-cream caramel for the filling, and rather than relying on corn syrup to help it set up I went with some eggs. Between caramel and raisins, it seemed like there was quite enough sweetness going on there already. adapted from The Joy of Baking and a description from a certain Curator of Art. Begin by making the pâte brisée. Combine the flour, sugar, and salt in the bowl of a food processor and blend well. Add the butter and pulse until the mixture is a fine, sandy texture. Slowly add water, pulsing intermittently, just until the dough begins to form pebbly chunks. Once you can pinch the dough between your fingers and it adheres together, it’s ready. Quickly bring the dough together in a ball and then pat out into a circle about 6-7 in. in diameter. Wrap it up in plastic wrap, and refrigerate until it feels firm enough to roll out. I don’t like the dough to get too hard, so I usually only wait about 15 minutes. I find it easier to work with when it is still a little bit soft. Once the dough has chilled, roll it out until it’s about 1/4 in. thick, and then cut into circles 4 in. in diameter. For size reference, I used a pint glass to do that part. 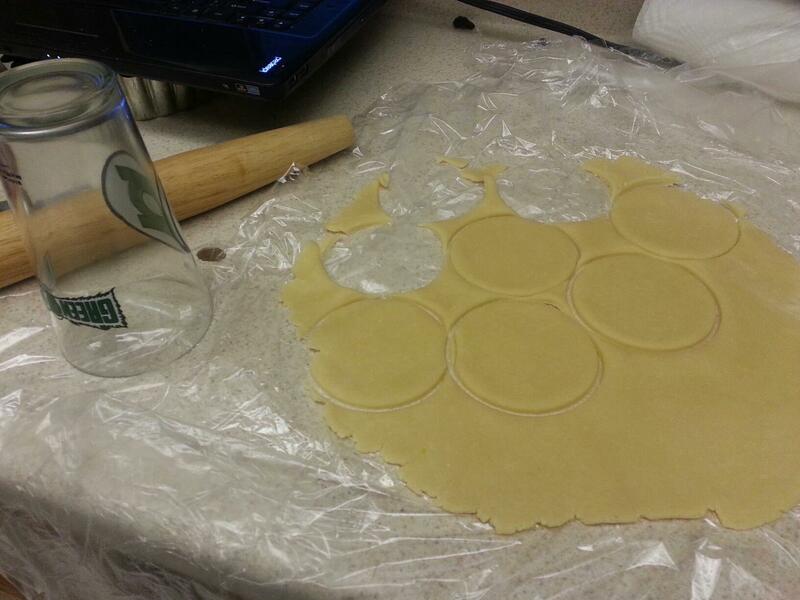 Fit the dough circles into a 12 cup muffin tin and pat them down gently and evenly. (Take your extra dough scraps and make cookies!) Set the tart shells aside while you prepare the filling. Using a stand or hand mixer, beat the butter and brown sugar together until light, smooth, and creamy. Add the eggs one at a time, beating between additions, and then add the vanilla extract. Stir in the cream by hand and mix until smooth. 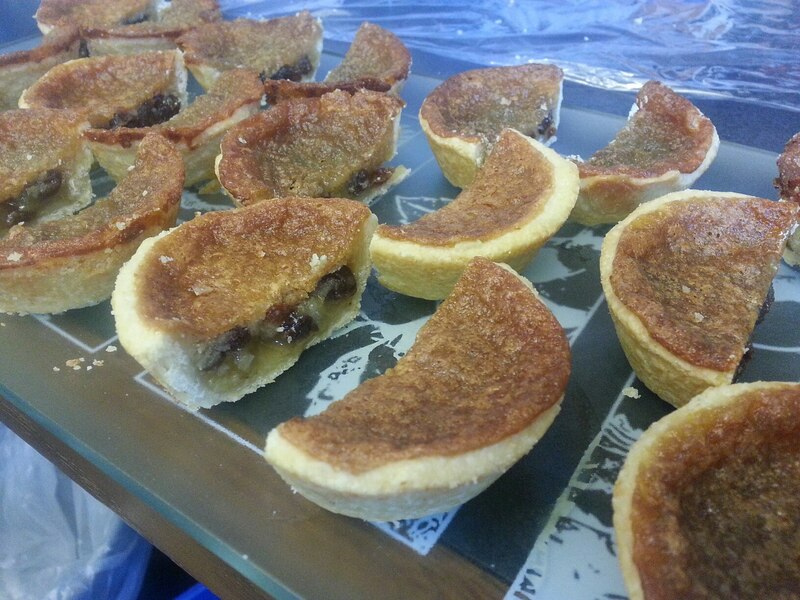 Place an even amount of raisins in the bottom of each tart shell and then add a spoonful of filling to each tart. Repeat spooning filling into the shells until you’ve used all of it. It ended up being about 2 tbsp. in each tart. 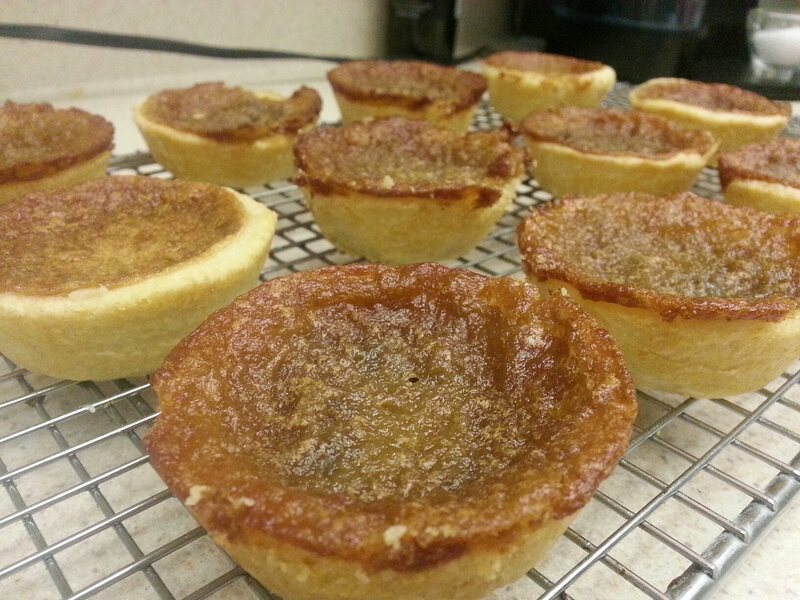 Bake the tarts for 16-17 minutes, or until the filling is puffed up and has set. The pastry will be golden-brown. The filling will deflate after you take them out of the oven. 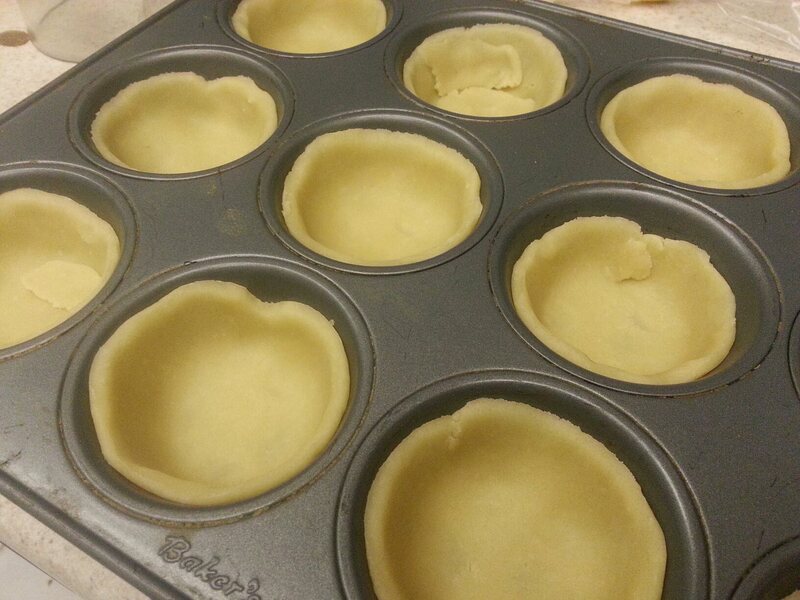 Place the pan on a wire rack and cool the tarts completely before de-panning. I actually chilled them in the fridge for an hour or two and then ran a knife around the edge of each. They came out very easily, one of the fortunate side effects of buttery pastry. Serve chilled or at room temperature. The recipe makes 12, but I cut them in half to serve, so there were 24 portions to go around. Verdict? Well, my friend and colleague said that they tasted just like the ones her grandmother used to make—and that that was a very good thing. It made my day to hear such a compliment, as you can imagine. So get to making this delicious treat from our friends up north! Between these and the Nanaimo bars, you might find yourself wondering how quickly you can pack up and move to where they are consistently available.